Crude oil, refined petroleum products, as well as polycyclic aromatic hydrocarbons are ubiquitous in various environmental compartments. They can bioaccumulate in food chains where they disrupt biochemical or physiological activities of many organisms, thus causing carcinogenesis of some organs, mutagenesis in the genetic material, impairment in reproductive capacity and / or causing hemorrhage in exposed population. The cause / effect of oil pollutant are usually quantified by using biological end point parameters referred to as biomarkers. Contamination of soil arising from spills is one of the most limiting factors to soil fertility and hence crop productivity. These deleterious effects make it mandatory to have a counter measure for the petroleum hydrocarbon pollutant in the environment. Bioremediation of petroleum hydrocarbon-contaminated environment is a potentially important application of Environmental Biotechnology. In this approach microorganisms are utilized under some specified conditions to ameliorate the negative effects in a cost-effective and environmentally friendly approach. The main strategies in bioremediation of oil spills, which include bio-stimulation, nutrient application, bio-augmentation, seeding with competent or adapted hydrocarbono-clastic bacteria or their consortium, and genetically engineered microbes, are reviewed. Although the promise of bioremediation is yet to be realized, innovative areas in Environmental Biotechnology for oil spill clean up are highlighted. The shift in economic base of coal to crude oil and petroleum products, more especially after the World War II, greatly increased the volume of these commodities being transported across the high seas. The above, coupled with their storage underground, involve high environmental risks. For example the wreck of the “Torrey Canyon “ off the coast of England in 1967 produced worldwide concern about the consequences of massive oil spills in the marine environment. Short, et al. (2002) reported that thirteen years after the Exxon Valdez oil spill in Prince William Sound, the toxic effects are still being felt due to the remaining bulk of the less-weathered subsurface oil. A random sampling of underground fuel storage tanks conducted by U.S. Environmental Protection Agency (USEPA) in the United States revealed about 35% leaks in these tanks (United Press International, 1986). The major concern with crude oil spill has been its contamination of ground water, and the subsequent clean up. With the stimulated research into the environmental fate and biological effects of spilled oil in the 1970s and to date, many advances have been recorded in the field of Environmental Biotechnology, with respect to crude oil pollution control and clean-up operations. Due to a lot of factors, oil pollution has continued to be of great concern to the entire world. Some of the difficulties include the fact that crude oil and petroleum are very complex mixtures of several thousands of hydrocarbons and other indeterminate structures and additives. The complexity of some ecosystems do not make for easy accessibility to determine the spilled oil condition at the moment of spill and thereafter. Oil spill clean-up operations may cause more harm to a fragile coastal marsh environment than the oil itself. One of the major fates of spilled petroleum oil in the coastal environment is its incorporation into the sediments (Alexander and Webb, 1987). Also the physiochemical properties of the spilled oil are not much known, with respect to the ecosystem involved. Problems associated with the study and remediation of the polluted ecosystem can be very expensive. Also the chemical processes (oxidation, photolysis) involved in degradation are not fully known. The legal problems related to compensation in terms of assigning monetary reward may bring serious controversy. The above not withstanding, there is need to have some knowledgeabout thechemicalprocesses involved in crude oil-ecosystem interactions, the public and environmental health issues associated with oil spills, engineering technologies involved in the clean-up and the government regulations therein. This will go a along way in mitigating the adverse effects of oil pollution of the environment. To this end, multidisciplinary approach will be needed and will involve different fields of Biology, Chemistry, Engineering, Economics, Education, etc. This review will address the innovative technologies in this multidisciplinary field of Environmental Biotechnology and other issues relating to crude oil pollution of the environment. Crude oil and petroleum are complex mixtures of severalpolycyclic aromatic compounds andother hydrocarbons (Domask, 1984). The major hydrocarbon classes found in diesel fuel (Mackay et al., 1985) are the normal alkanes (rapidly degraded), branched alkanes and cycloalkanes (difficult to identify), the isoprenoids (very resistant to biodegradation), the aromatics, (fairly identified and much more soluble than other hydrocarbons), and finally the polar onescontaining mainly sulphur, oxygen and / or nitrogen compounds. 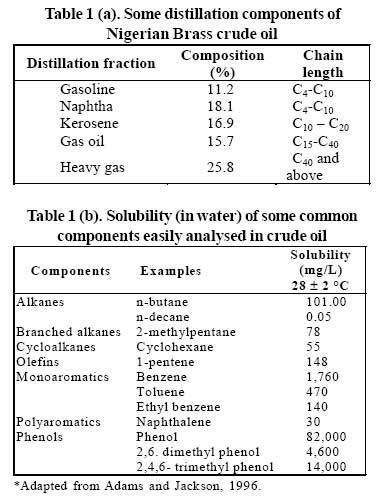 Typical composition of crude oil based on distillation properties is illustrated in Table1a while Table 1b shows some examples and aqueous solubility of hydrocarbon compounds commonly analyzed in crude oil (Adams and Jackson, 1996). Nonhydrocarbon compoundsmay also befound in crude oil and they include porphyrins and their derivatives (Callot and Ocampo, 2000). Metals that could be found in crude oil via their association with porphyrins include nickel, vanadium, iron, zinc, cobalt, titanium andcopper (Chicarelli, et al., 1990.) Some priority contaminant of petroleum hydrocarbons and crude oil include benzene, heptanes, hexane, isobutene, isopentane, PAHs such as benzo[a] anthracene, benzo[b] pyrene etc. Diverse components of crude oil and petroleum such as polycyclic aromatic hydrocarbons (PAHss) have been found in waterways as a result of pollution from industrial effluents and petrochemical products (Beckles, et al., 1998). *Adapted from Adams and Jackson, 1996. Petroleum hydrocarbon pollution of the environment may arise fromoil well drilling production operations, transportation and storagein the upstream industry, and refining, transportation, and marketing in the downstream industry. Petroleum hydrocarbon pollutionof the environment may arise fromoilwell drilling production operations, transportation and storage in the upstream industry, and refining, transportation, and marketing in the downstream industry. Petroleumhydrocarbon pollution could also be from anthropogenic sources (Oberdorster and Cheek, 2000). Some non combusted hydrocarbons escape into the environment during the process of gas flaring. Until recently, the bulk of the associated gas produced during drilling in Nigeria, was flared. Sources of petroleum and its products in the environment will also include accidental spills and from ruptured oil pipelines. Today the international oil and gas-pipelines spanseveral million kilometers and this is growing yearly. Just like any other technical appliance, pipelines are subject to ‘’tear and wear’’, thus can fail with time (Beller, et al., 1996). Spilled petroleum hydrocarbons in the environment are usually drawn into the soil due to gravity until an impervious horizon is met, for example bedrock, watertight clay or an aquifer. Poor miscibility of crude oil accounts for accumulation of free oil on the surface of ground water and this may migrate laterally over a wide distance to pollute other zones very far away from the point of pollution. Industrial and municipal discharges as well as urban run-offs, atmospheric deposition and natural seeps also account for petroleum hydrocarbon pollution of the environment. 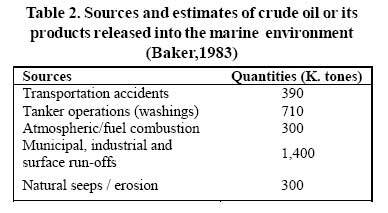 Table 2 (Baker, 1983) is a summary of some sources and estimated quantity of crude oil released into some named ecosystem. It is worthy of note that groundwater is one of the many media by which human beings, plants and animals come into contact with petroleum hydrocarbon pollution. Crude oil, a mixture of many thousands of organic compounds, can vary in composition from one source to another. This suggests that the effects of crude oil spill will vary from source to source. However details of the potential biological damage will depend on the ecosystem where the spill occurred. The aquatic ecosystem, particularly the marines are the most vulnerable (Cairns and Buikema, 1984). Sources of crude oil into some marine ecosystem are listed in Table 2. Oil spills in the marine environment may affect organisms found therein by direct toxicity or by physical smothering (Perry, 1980). Oil spills generally, can cause various damages to the marsh vegetations. It was found to reduce growth, photosynthetic rate, stem height, density, and above ground biomass of Spartina alterniflora and S. Patens and may cause their death (Krebs and Tamer, 1981). Crude oil spill at sea forms a surface slick whose components can follow many pathways. Some may pass into the mass of seawater and evidence suggests they may persist for a long time before their degradation by microorganisms in the water. The slick usually becomes more viscous and forms water-in-oil emulsion. Oil in water causes depletion of dissolved oxygen due to transformation of the organic component into inorganic compounds, loss of biodiversity through a decrease in amphipod population that is important in food chain, and eutrophication. Short-term toxicity in fishes includes lymphocytosis, epidermal hyperplasia, hemorrhagic septicemia (Beeby, 1993). In mammals it possesses an anticoagulant potency (Onwurah, 2002a). It was estimated that some tens of thousands of seabirds were killed as a result of spilled oil in sea (Dunnet, 1982). Dying mangrove trees, tarred beaches and declining fish catches, all seem to be threats to long term viability of some ecosystem such as the Niger Delta areas of Nigeria after. Apart from inherent toxicity of spilled oil in seas, enhanced toxicity has been reported due to ultra violet (U.V) radiation. This is referred to as photo enhanced toxicity (Barron, et al., 2003). Pelletier, et al. (1997) observed that un-weathered Prudhoe Bay crude oil was one hundred times more toxic to shrimps and bivalve embryos after exposure to U.V light. The photo enhanced toxicity in fish and aquatic invertebrates appears to occur through activation of chemical residues that bioaccumulate in these organisms (Calfee, et al., 1999). Generally, crude oil is toxic to aquatic organisms, due to the presence of PAH (Heintz et al., 1999). This is because, PAHs exposed to solar UV radiation can generate 1O2 via photosensitization (Babu, et al., 2002) whereby toxic PAH quinones are produced (). Crude oil as a result of it’s PAH content; disrupt the development, immunity, Fig. 1 reproduction, growth and survival of aquatic organisms (Brown, et al., 1996). Oil spill in the environment could lead to an increased exposure of by-products of PAHs to a given human population. This may increase risk of mortality from infectious disease (Hall, et al., 2006) and the reproductive capacity of that population (Tiido, et al., 2006). However, the carcinogenic pathway of a crude mixture of PAHs may be less than the sum total of anticipated carcinogenicity when the potency of the known PAHs (carcinogen) in the crude mixture is considered (Falk, et al., 1964). This suggests that PAHs in crude oil may interact in such a way as to reduce the tumorigenic risk. On land, crude oil spills have caused great negative impact on food productivity. For example, a good percentage of oil spills that occurred on the dry land between 1978 and 1979 in Nigeria, affected farm-lands in which crops such as rice, maize, yams, cassava plantain were cultivated (Onyefulu and Awobajo, 1979). Crude oil affects germination and growth of some plants (Onwurah 1999a). It also affects soil fertility but the scale of impact depends on the quantity and type of oil spilled. Severe crude oil spill in Cross-River state, Nigeria, has forced some farmers to migrate out of their traditional home, especially those that depend solely on agriculture. This is because petroleum hydrocarbons ‘sterilize ’the soil and prevent crop growth and yield for a long period of time. The yield of steroidal sapogenin from tuber tissues of Dioscorea deltoidea is adversely affected by some hydrocarbons (Hardman and Brain, 1977). The negative impact of oil spillages remains the major cause of depletion of the Niger Delta of Nigeria vegetative cover and the mangrove ecosystem (Odu, 1987). Crude oil contamination of land affects certain soil parameters such as the mineral and organic matter content, the cation exchange capacity, redox properties and pH value. As crude oil creates anaerobic condition in the soil, coupled to water logging and acidic metabolites, the result is high accumulation of aluminum and manganese ions, which are toxic to plant growth. It is conceivable to say that there is a link between environmental health and human health. While human health is a deep field of science from time of old, the concept of ‘environmental health ’can be viewed as a modern science, which is measured as the viability of the inhabitants of a given ecosystem as affected by ambient environmental factors (Shields, 1990). Practically, environmental health involves the assessment of the health of the individual organisms and correlating observed changes in health with changes in environmental conditions. Some diseases have been diagnosed to be the consequences of crude oil pollution. The health problems associated with oil spill may be through any or combinations of the following routes: contaminated food and / or water, emission and / or vapors. Toxic components in oil may exert their effects on man through inhibition of protein synthesis, nerve synapse function, and disruption in membrane transport system and damage to plasma membrane (Prescott, et al., 1996). Crude oil hydrocarbons can affect genetic integrity of many organisms, resulting in carcinogenesis, mutagenesis and impairment of reproductive capacity (Short and Heintz, 1997). The risk of drinking water contaminated by crude oil can be extrapolated from its effect on rats that developed hemorrhagic tendencies after exposure to watersoluble components of crude oil (Onwurah, 2002). Volatile components of crude oil after a spill have been implicated in the aggravation of asthma, bronchitis and accelerating aging of the lungs (Kaladumo, 1996). Other possible health effects of oil spill can be extrapolated from rats exposed to contaminated sites and these include increased liver, kidney and spleen weights as well as lipid per-oxidation and protein oxidation (Anozie and Onwurah, 2001). Biotechnology is defined as a set of scientific techniques that utilize living organisms or parts of Oxidation from organisms to make, modify or improve products (which could be plants or animals). It is also the development of specific organisms for specific application or purpose and may include the use of novel technologies such as recombinant DNA, cell fusion and other new bioprocesses (Anon, 1991.) It is also that aspect of biotechnology, which specifically addresses issues in environmental pollution control and remediation (Onwurah, 2000). This goes to say that it involves many disciplines in biology, agriculture, engineering, health care, economics,mathematics, and education. It is regarded today as fundamentally an engineering application of microbial ecology (Rittman et al., 1990) and process design. The engineering aspect of environmental biotechnology involves the design /construction and design of special machines or equipment referred to as reactors or bioreactors. Environmental biotechnology also encompasses quantitative mathematical modeling whereby understanding and control of many inter-related processes become possible. Mathematical modeling technology transcends the boundary of single traditional scientific disciplines and technologies, whereby a logical framework resolves related problems (Ziegler 2005; Onwurah 2002b). They are tools utilized economically for explaining the cost and effectiveness of different options of clean-up technology and control (Onwurah and Alumanah 2005; Ziegler 2005). One of the greatest challenges to humanity today is the endangering of biota as a result of environmental pollution from crudeoil. Toestimate the biological danger of oil after a spill, knowledge of the harmful effects of the components is necessary. In other to obtain or ascertain the effects of such polluting substance, every living being and life function can be considered a potential biomarker or bio-indicator. A biomarker is an organism or part of it, which is used in soliciting the possible harmful effect of a pollutant on the environment or the biota. Biomonitoring or biological monitoring is a promising, reliable means of quantifying the negative effect of an environmental contaminant. In a broad sense, biological markers (biomarkers) are measurement in any biological specimens that will elucidate the relationship between exposure and effect such that adverse effects could be prevented (NRC., 1992). It should be instituted whenever a waste discharge or oil spill has a possible significant harm on the receiving ecosystem. It is preferred to chemical monitoring because the latter does not take into account factors of biological significance such as the combined effects of the contaminants on DNA, protein or membrane. Some of the advantages of biomonitoring include the provision of natural integrating functions in dynamic media such as water and air, possible bioaccumulation of pollutant from 103 to 106 over the ambient value and / or providing early warning signal to the human population over an impending danger due to a toxic substance. Microorganisms can be used as an indicator organism for toxicity assay or in risk assessment. Tests performed with bacteria are considered to be most reproducible, sensitive, simple, economical and rapid (Mathews, 1980). Some examples include the ‘rec-assay’ which utilizes Bacillus subtilis for detecting hydrophobic substances (hydrocarbons) that are toxic to DNA (Matsui, 1989), Nitrobacter sp, which is based on the effect of crude oil on oxidation of nitrite to nitrate (Okpokwasili and Odukuma, 1994), and Azotobacter sp, used in evaluating the effect of oil spill in aquatic environment (Onwurah, 1998). Multiple bioassays that utilize a variety of species can be applied to gain a better understanding of toxicity at a given trophic level and under field condition. Several criteria exist for selecting biomarkers of plant and animal origin. Biomarkers, as fingerprints for identifying mystery oil spills, are now in use and they include steranes, phytanes, and hopanes. The normal hexadecane, an n-alkane found in crude oil is often used because of its low volatility and high hydrophobicity (Foght, et al., 1990). These markers are integral part of crude oil and are not affected or degraded easily by any biological process. Hence they remain as “skeleton” of the crude oil even after a natural degradation has taken place. Steranes in crude oil are derived from the algae or the plant from which the source rock originated, while hopanes are derived from the hopenetetrol present in bacteria (Peters and Moldowan, 1993). Hopanes can be used to determine the nature of the source rock that generated a crude oil. Biosensor is a technology that promises to be important in generating future standards regarding both bioavailability and toxicity of any pollutant being released into the environment. Biosensors are usually photo detector systems, which operate on the genes that control luminescence (King et al., 1990). Most of the biosensor tests are not quantitative, but rather can detect the potential activity or presence of an environmental toxicant. Examples include the Petro-Risk Soil Tests System (DTSC, 1996) used in detecting total petroleum hydrocarbons in a given soil after an oil spill. The test kit uses enzyme-linked immunosorbent assay (ELISA) technology. It involves an antibody with affinity to certain petroleum hydrocarbons. The antibody that does not react with the methanolic extract of the petroleum hydrocarbons or crude oil in the soil sample is detected by a color reaction. The color intensity developed decreases as the hydrocarbon concentration increases. A differential photometer is usually incorporated. Other examples include the Microtox, which utilizes the luminescent bacteria, Vibro fischeri (Photobacterium phosphoreum), in monitoring toxicity of petroleum hydrocarbon. The bacterium, Vibro fisheri utilizes about 10% of its metabolic energy for bioluminescent activity. The luminescent pathways are linked to cellular respiration whose disruption will change the light output (Ross, 1993), or on the structure-activity relationship of the individual compounds in the crude oil or petroleum (Cronin, and Schultz, 1998). Bioremediation is a technology that exploits the abilities of microorganisms and other natural habitat of the biosphere to improve environmental quality for all species, including man. The development of innovative bioremediation technology as a functional tool in clean-up of crude oil polluted environment has depended so much on the basic knowledge of the physiology and ecology of the natural bacterial populations found in such polluted sites. Many advances in biochemistry and molecular biology are now applied in various bioremediation efforts (Olson and Tsai, 1992; Bouwer, 1992).Accordingtosome investigators (Barbee, et al., 1996; Ritter and Scarborough, 1995), bioremediation does not always result in complete mineralization of organic compounds. Many of these compounds are naturally transformed to metabolites of unknown persistence and toxicity. Therefore some basic steps that may be necessary for a successful bioremediation project will include compliance analysis, site characterization, method selection / feasibility studies, remediation proper and end for project analysis (Bonaventura, et al., 1995). Compliance analysis requires examination of the contaminated site in the light of the governing regulation and the action plan. Examination of the site will lead to its characterization and this is a very challenging and difficult aspect of a bioremediation efforts. Knowledge of soil parameters such as cation exchange capacity, relevant nutrient availability, acidity (soil pH), aeration or oxygen level, hydraulic properties etc are paramount and this requires the assistance of specialists in these areas. The last stage of any bioremediation project should include bioassay of the treated site. This confirms complete or near complete removal of the PHC contaminant. According to Lovely (2003), combining models (including mathematical models) that can predict the activity of microorganisms involved in bioremediation with existing geochemical and hydrological models should transform bioremediation technology. Some necessary process variables involved in bioremediation of petroleum hydrocarbon polluted environments that need to be known include the characteristics of the polluting crude oil, its biodegradability and the characteristics of the polluted site (physical and chemical) Logistic problems withrespect to accessibility to thepolluted site (e.g. swamps) must be known, together with the impact of the clean-up operation. The last point is very important because it is known from several studies that in some natural detoxification processes, cellular mechanisms of hydrocarbon compound metabolism can create compounds or metabolites that are more toxic than the parent hydrocarbons, especially when the end products are not only carbon dioxide and water. The situation is even complicated by the fact that biochemical reactions rarely proceed by a single pathway. Hence one of the greatest difficulties in assessing the success of bioremediation of crude oil-contaminated environment is having knowledge of the fate of the metabolites after uncontained in situ treatment (Jenkin and Sanders, 1992). In full-scale bioremediation technologies of crude oil polluted ecosystems, many rate-limiting factors are known (Atlas, 1991; Prince, 1992), and they include presence of other toxic compounds other than crude oil pollutant, the level of available oxygen and nutrients (particularly nitrogen and phosphorus), temperature and pH. Other factors are moisture content or water availability, biodiversity of hydrocarbonoclastic and cometabolising bacteria at the site. The adsorptive capacity of the hydrocarbons to the soil and sediment, and rate of mixing and mass transfer are also important factors. In terrestrial ecosystem, spilled oil adsorbs to the soil particles, forming a cohesive, toxic mixture that is deleterious to the indigenous microorganisms. These events or soil characteristics reduce or increase the bioavailability of petroleum hydrocarbons, the inherent toxicity and hence biodegradability. These factors are responsible for the long delays in the mineralization of the petroleum hydrocarbons (PHC) by the indigenous or applied microbial populations. Effective metabolism of crude oil requires adequate oxygen supply as electron acceptor. Under low oxygen tension as in the mangrove ecosystem, the use of biologically active absorbent (Gregorio, 1996) to fix the oil and effect medium term biodegradation is desired. It should be noted that the extent of crude oil impact on the soil equally depends on the concentration spilled, ease of dissociation from the soil matrix, particle size of the soil, porosity, or permeability. To facilitate bioremediation requires methods that can dissociate the PHC and create conditions for mass transfer process (Onwurah, 2000). Bioremediation of crude oil contaminated environment may require some engineering process, so as to facilitate recovery efforts. Engineering may include construction of booms, trenches, and barriers for contaminant containment, boreholes, bio-cells and using engineered microbial systems. Increasing bioavailability of the PHC can be achieved by physically processing thecrude oil-polluted soil or sediment by excavation, pulverising and mixing .The above processes maximize aeration and surface area for microbial activity. Some specific bioremediation processes that may require engineering are summarized below. The simplest method of bioremediation of oilpolluted soil is in situ land treatment. This technology utilizes standard farming procedures such as plugging the oil-polluted soil with a tractor, periodical irrigation and aeration. This technology embraces the use of aerobic microorganisms to degrade the PHC and other derivatives to carbon dioxide and water, or other less toxic intermediates. Experience has shown that when land-farming technology is properly executed for PHC contaminated soil, non-volatile components of petroleum and other related products are rapidly immobilized, so may not be leached out. This technology may involve nutrient enrichment in the form of fertilizer application or further manipulation of site conditions such as inoculations with selected or adopted microbial population, mixing and aeration of the soil surface, pH adjustment and irrigation. Using this technology an enhancement in the decontamination of 50cm topsoil of an area previously polluted with crude oil was achieved (Compeau, et al., 1991). Possible enhanced soil fertility recovery for such oil polluted agriculture soil has been demonstrated in soil microcosm experiments where germination and growth of sorghum grains were improved after treatment with adapted Azotobacter inoculum (Onwurah, 1999a). Composting technology is becoming important in the treatment of oil polluted coastal area. It involves the mechanized mixing of contaminated soil or sediment with compost-containing hydrocarbonoclastic bacteria, under aerobic and warm conditions. Through the addition of corn slash (post harvest leaves and stems), microbial nitrogen fixation has been co-optimized with petroleum hydrocarbon degradation (Paerl, et al., 1996). A bioreactor is essentially an engineered system in which biochemical transformation of materials is promoted by optimizing the activity of microorganisms, or by “in vitro” cellular components of the microbial cells (enzymes). Bioreactors for the remediation of oil-polluted soil utilize an aqueous slurry phase system. Slurry bioreactor is considered as one of the fastest bioremediation technologies because contaminants can be effectively transportedto the microbial cells (Mueller et al., 1991). Some limiting factors affecting the slurry phase bioreactor process during decontamination of oil-contaminated soil and how they can be controlled are listed in Table 3.An attractive alternative to the slurry bioreactors for treating oil-contaminated soils are the rotating drum bioreactors since they can handle soils with high concentrations of petroleum hydrocarbons (Gray et al., 1994; Banerjee et al., 1995). The fluid phase enhances transport of nutrients and “solublized” or dispersed PHC contaminants to the degrading bacteria. With a bioreactor, temperature, pH and other parameters are optimized for degradation. The rotating drum bioreactor incorporated with blade impellers inside was demonstrated to be effective in decontaminating hydrocarbon-polluted soil (Hupe et al., 1995). The contaminated soil must be excavated, mixed with water and introduced into the reactor. Generally the rate-limiting factors in any bioreactor system used for crude oil degradation are, the degree of PCH solubilisation through bio-surfactant production and the level or concentration of active biomass of hydrocarbonoclastic bacteria maintained in the system (Stroo, 1992). Degradation products in bioreactors are easily monitored and input regulated. Bioreactors are however intrinsically more expensive than in situ or land treatment technologies because they are specialized. Biodegradation, especially by microbes, is one of the primary mechanisms of ultimate removal of petroleum hydrocarbons from polluted environments (Atlas, 1988; NRC, 1985). The acceleration of this natural process is the objective of bioremediation efforts. Seeding a contaminated environment with strains of bacteria that are tolerant and capable of degrading a high percentage of the contaminating petroleum hydrocarbons, and thus supplementing the natural resident microbial population has proven to be useful in bioremediation. The relative success of such adapted (oxotic) bacteria when added to crude oil polluted site will depend on a number of factors including competitive interactions with the native bacteria, their rate of growth in the system as well as their tolerance to the physico-chemical environment (Leahy and Colwell, 1990). Table 4 shows some novel microbial systems that have been applied in PHC degradation. Some of these cultures have been developed as proprietary products through selection of genetically able (not engineered) microorganisms from mixed cultures that are found in a natural contaminated environment as opposed to the genetically engineered strains of microorganism. Assessment of the utility of inoculation or seeding oil spill sites with selected or adapted microorganisms has, thus far,been inconclusive (Pritchard and Costa,1991). However, seeding with high density of the microbial cells increases the success of the operation (Onwurah and Nwuke 2004). The utility of adapted microbial consortium and nutrients in bioremediation of oil-polluted environment has been demonstrated (Adams and Jackson, 1996). have greater potential in bioremediation of the polluted environment because they have been tailored to perform such a function. There is however a great concern that the use of GEMs may adversely affect biodiversity. There is this theory that an engineered microbe specifically designed to mineralize spilled crude oil may wreck havoc on stored fuel supplies and even to the extent of depleting crude oil reserves or deposits if not contained. Owing to the great uncertainty and regulation, the full bioremediation prospect of GEMs remains un-quantified. This is an approach in which plants are used in clean up of contaminated environments. It is an emerging technology that promises effective, inexpensive, and less intrusive clean up and restoration of oil-contaminated environments (Stomp, et al., 1993; Schnoor, et al., 1995). Phytoremediation involves plant that aid in the restoration of contaminated ecosystem (Cunningham and Berti, 1993). A green plant is a solar-driven, pumping, and effective filtering system endowed with measurable loading degradative and fouling capacities (Salt, et al., 1995). Salt marsh plants are able to take up hydrocarbons from oil-contaminated sediment and increase the hydrocarbon or total lipid fraction of the aerial portions of plants (Lytle and Lytle, 1987). There are three established mechanisms by which plants decontaminate oil polluted sites and these are direct uptake of petroleum hydrocarbons into their tissues; release of enzymes and exudates that stimulate the activity of hydrocarbonoclastic microbes and direct biochemical transformation (enzymes) of petroleum hydrocarbons; enhancement in the degradation of the contaminants in the rhizospheredue to mycorrhizal fungi and the activity of soil microbial consortia (Schnoor et al., 1995). Plants that are resistant to crude oil toxicity such as black poplar and willows, as well as miscanthus grass (elephant grass) have been found to be effective in the remediation of oil polluted soil (Shank and McEwan, 1998). In the marsh environment Spartina patens, Sagittaria lancifolia, Spartina alterniflora and Juncus roemeriannus are considered ecologically and economically important in phytoremediation (Lytle and Lytle, 1987). Dioscorea sp can metabolise petroleum hydrocarbons such as nhexadecane (Hardman and Brain, 1977). Cytochrome P450 and peroxidases found in the plant Dioscorea composta are involved in the biotransformation of this hydrocarbon (Vega-Jarquin et al., 2001). One major set back in phytoremediation is that the plants tend to be competing with the hydrocarbonoclastic microbial population for available fixed nitrogen and phosphorus. However, phytoremediation can accelerate the reduction of oil concentration in both surface and deep soil, and thus restore crop sustaining potential and reducing marsh erosion after a spill. Effective bioremediation of crude oil polluted environment will require a consortium of microbial communities. An ecological balance of the key microbes required in all aspects of bioremediation of crude oil polluted ecosystem, including cometabolising bacteria, is very important. Table 5 shows some key areas of research in this approach (Ritmann, 1992.). For PHC degradation in treatment plants, it is essential that selected bacteria are those that can floc together, without becoming ‘filamentous’ (Rittmann, 1987). Another community structure, which is being harnessed, is the possible co-existence of heterotrophic and autotrophic bacteria. Competition between this group, particularly the aerobic heterotrophs and nitrifying bacteria has been stressed (Rittmann, 1987). However, some workers have co-optimized biological nitrogen fixation (Paerl et al. 1996) or microbial nitrogen fixation (Onwurah, 1999b) with biodegradation of petroleum hydrocarbons in the coastal environment and soil systems respectively. The capability of simultaneous existence of heterotrophic and adapted autotrophic bacteria, (Pseudomonas sp and A. vinelandii) within oilpolluted environment has been demonstrated (Onwurah, 1999b). Also very important is the use of high inoculum of adapted microbial population in bioremediation of oil-polluted environment. When adapted microbial strains taken from contaminated soil are introduced into a new oil spill location at high cell density, they can alter the genetic capabilities of the different bacteria in this new environment (Smets et al., 1990). This was demonstrated when A. vinelandii was isolated from a previously oil contaminated site and introduced into a newly oil polluted site, whereby nitrogen fixation and co-metabolism contributed in enhanced bioremediation (Onwurah, 1999b). Gene distribution within strains could provide a level of community structure that can superimpose on the natural ecological structure from the mixed adapted inoculate populations. Environmental biotechnology is an embodiment of several areas of research that is driven by service and regulation. The extensive utilization of crude oil as a major source of energy has increased the risks of accidental spills and hence pollution of the environment. Today, the need to reduce the negative impacts of PHC pollution due to spills is motivating many researchers into innovations in various aspects of environmental biotechnology that will usher in sustainable development and sustainable environment. The integration of several of these technological advances for ameliorating the negative effects of oil spills in the environment will be most expedient and this review is aimed at highlighting many of these advances. Having a good knowledge or understanding of the various biotechnological advances so far made in clean-up of PHC contaminated ecosystems will further equip bioremediation engineers in designing programs for a more effective and comprehensive clean-up operations. The need for nitrogen compound during any bioremediation of environment contaminated by crude oil is well documented. 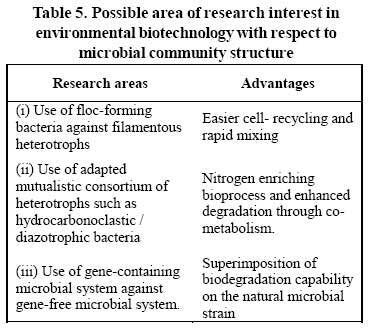 Hence microbial consortiuminvolving diazotrophic bacteria and hydrocarbonoclastic bacteria should be designed or engineered for bioremediation of crude oil polluted sites. Results obtained from preliminary researches in this area are promising and there is room for improvement. The ecology of such bacteria consortium is a new research area that may present a significant scientific breakthrough. Clean up of hydrocarbon contaminated ecosystem should be approached in a costeffective and environmentally friendly manner. Bioremediation is still the most acceptable technology that can meet up with the regulations that govern clean up of oil-polluted sites. However, all aspects of bioremediation should be integrated with respect to the site in question for rapid and effective remediation efforts, and monitoring should be an integral aspect of any bioremediation program. Adams, P. J., (1996). Bioremediation of oil spills: Theory and Practice. Proceedings of the 8th. Biennial International NNPC Seminar. In: The Petroleum Industry and the Nigeria Environment, Port Harcourt, Nigeria, 183-203. Alexander, S. K. and Webb, J. W., (1987). Relationship of Spartina alterniflora growth to sediment oil content following on oil spill. Proceeding of the 1987-Oil Spill Conference, American Petroleum Institute, Washington, DC, 445-449. Anon. Report on National Biotechnology Policy. White House Councilon competitivenessWashington DC,1991. Anozie, O., Onwurah, I. N. E., (2001). Toxic effects of Bonny light crude oil in rats after ingestion of contaminated diet. Nigerian J. Biochemistry and Molecular Biology (Proceedings Supplement ). 16 (3), 1035-1085. Atlas, R. M., (1991). Microbial hydrocarbon degradation: bioremediation of oil spills. J. Chem. Technol. Biotechnol., 52, 149-156. Atlas, R. M., (1988). Biodegradation of hydrocarbons in the environment, In: Environmental Biotechnology Omenn, GS EdPlenum Press, NewYork. Babu, T. S., Huang, X. D., Greenberg, B. M., (2002). Reactive oxygen species mediated toxicity of environmental contaminants In: Learned Discourses: TimelyScientific Opinions SETACGlobe, 3(3), 26-28. Baker, J. M., (1983). Impact of Oil Pollution on Living Resources: Commission on Ecology Papers No 4 International Union for Conservation of Nature and Natural Resources , Gland, Switzerland. Banerjee, D. K., Fedora, P. M., Hashimoto, A., Masliyah, J. H., Pickard, M.A. andGray, M. R., (1995). Monitoring the biological treatment of anthracite-contaminated soil in a rotating –drum bioreactor. Appl. Microbial. Biotechnol., 43, 521-528. Barbee, G. C., Brown, K. W., Thomas, J. C., Donelley, K. C., Murray, H. E., (1996). Mutagenic activity (Ames test) of wood-preserving waste sludge applied to soil Bull. Environ Contam Toxicol., 57, 54-62. Barron, M. G., Carls, M. G., Short, J. W. and Rice, S. D., (2003). Photoenhanced toxicity of aqueous phase and chemically dispersed weathered Alaska North Slope Crude oil to pacific herring eggs and lavae. Environ. Toxicol. Chem., 22 (3). 650-660. Beckles, M. D., Ward, C. H., Hughes, J. E., (1998). Effect of mixtures of polycyclic aromatic hydrocarbons and sediments of fluoromethane biodegradation pattern Environ. Toxicol. Chem., 17, 1246-1257. Beeby, A., (1993). Measuring the effect of pollution. In: Applying Ecology. Chapman and Hall, London, New York. Bouwer, E. J., (1992). Biorermediation of organic cantaminants in the subsurface. Environmental Microbiology. ed Ralph Mitchell. John Wiley and Sons Pub. NewYork. 287-318. Brown, E. D., Norcross, B. L. and Short, J. W., (1996). An introduction to studies on the effects of Exxen valdez oil spill in early life history stages of Pacific herring, clupae pallasi, in Prince.Williian Sound, Alaska. Can J Fish Aquat, Sci., 53, 2337-2342. Cairns, J., Buikema, A. L., (1984). Restoration of habitats impacted by oil spills. (Ann Arbor Science) Butterworth, Boston. 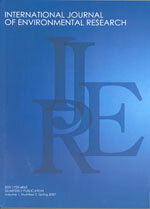 Calfee, R. D., Little, E.E, Clevel and L. Barron, M. G., (1999). Photoenhanced toxicity of a weathered oil to Ceriodaphnia dubia reproduction.Environ. Sci. Pollut. Res., 6, 207-212 . Callot, H. J., Ocampo, R. (2000), Geochemistry of porphyrins. In: Kadish K.M, Smith, K.M., Guilard, B, eds. The porhpyrin handbook Vol 1, Academic, San Diego, C.A USA . 349-398. Chakrabarty, A. M., (1982). Biodegradation and detoxification of environmental pollutants. New biotechnological approaches to environmental problems. Biotech., 1, 67-74. Chicarelli, M. I., Eckardt, C. B., Owenn, C. R., Maxwell, J. R., Eglington, G., Hutton, R. C., Eaton, A. N. (1990). Application of inductivity coupled plasma mass spectrometry in the determination of organometallic compounds in chromatographic fractions from organic rich shales. Organ. Geochem., 15, 26-274. Compeau, G. C., Mahaffey, W. D., Patras, L., (1991). Full scale bioremediation of contaminated soil and water. In : Environmental biotechnology for waste treatment. Eds. GS Sayler, R. Fox, JW Blackbourn. Plenum Press, NewYork and London. Environ. Sci. Res., 25, 91-109. Cronin, M. T. D., Schultz, T. W., (1998). Structuretoxicity relationships of three mechanism of actions of toxicity to Vibrio fischeri. Ecotoxicol. Environ. Saf., 39, 65-69. Cunningham, S. D., Berti, W. R., (1993). Remediation of contaminated soil with green plants: An overview. In: Vitro cellular and Developmental Biology, Plant 29. 207-212. Department of Toxic Substances Control (DTSC), (1996). State of California EPA Petro Rise Soil Test System. A rapid immuno- assay screen for total petroleum hydrocarbons in soil. Ensys. Inc. Research Triangle Park, N.C 27709. Domask, W. G. (1984). Introduction to petroleum hydrocarbons. Chemistry and composition in relation to petroleum derived fuels and solvents. Renel Effects of petroleum hydrocarbons. Adv. Nod. Environ. Tox. 8, 1-26. Dunnet, G. M., (1982). Oil pollution and seabird populations. Philosophical Transactions of the Royal Society of London, B 297, 413- 427. Falk, H. L., Kotin, P., Thompson, S., (1964). Inhibition of carcinogenesis. Arch Environ Health. 9, 169-179. Forght, J. M., Fedorak, P. M., Westlake, D. W. S., (1990). Mineralization of [14C] hexadecane and [14C] phenanthrene in crude oil. Specificity among bacterial isolates. Can J Microbiol., 36, 169-175. Gregorio, F., (1996). Microbe-sorb, a new product for the biotreatment of oil spills. International Bioremediation services Group, Westgate Aldridge Birmingham.UK. Gray, M. R., Banerjee, D. K., Fedora, K. P. M., Habhimoto,A., Maslryah,J. H., Pickard, M.A., (1994). Biological remediation of anthracene-contaminated soil in rotating bioreactors. Appl. Microbial Biotechnol., 40, 933-944. Hall, A. J., Hugunin, K., Deaville, R., Law, R. J., Allchin, C. R., Jepson, P. D., (2006). The risk of infection from polychlorinated biphenyl exposure in the Harbor Porpoise (Phocoena phocoena): A case-control approach. Environmental Health Perspectives, 114, 704-711. Hardman, R., Brain, K. R., (1977). The effect of extraneous hydrocarbons in the yield of Steroidas sapogenin from the tuber tissue of Dioscorea deltoidea. Phyto-chemstry, 10, 1817-1822. Heintz, R. A., Short, J. W. and Rice, S. D., (1999). Sensitivity of fish embryos to weathered crude oil Part 11.Increased mortalityofpuck salmon (onchorpynchus gorbusca) embryo incubating downstream from weathered Exxen Valdez crude oil. Environ. Toxicol. Chem., 18 , 494-503. Hupe, K., Luth, J. C., Heerenklage, J., Stegmann, R., (1995). Blade-milking reactors in the biological treatment of contaminated soils, in Biological unit processes for HazardousWasteTreatment. Ed by HuncheeRE, Skeen RS, and Sayles GD, Battele Press, Columbus. 153-159. Jenkins, K. D., Sanders, B. M., (1992). Biomonitoring with biomarkers:A multi-tiered framework for conducting the ecological impact of contaminants. In: Ecological indicators. Mekenzie, D., Hyatt, E., McDonald, J. Eds. Elsever, NewYork. Kaladumo, C. O. K., (1996). The implications of gas flaring in the Niger Delta Environment. Proceedings of the 8th Biennial International NNPC Seminar . In: The Petroleum Industry and the Nigerian Environment , Port Harcourt, Nigeria, 277-290. King, J. M. H., DiGrazia, P. M., Applegate, B., Bulage, R., Sanseverio, J., Dunbar, P., Larimwer, F., Sayler, G. S., (1990). Rapid sensitive bioluminescent reporter technology for naphthalene exposure and biodegradation. Science, 249, 778. Krebs, C. T., Tanner, C. E., (1981). Restoration of oiled marshes through sediment stripping and Spartina propagation. Proceeding of the 1981 oil spill conference, American petroleum institute, Washington DC .,375-385. Leahy, J. A., Colwell, R. R., (1990). Microbial degradation of hydrocarbons in the environment. Microbiological Reviews, 54, 305-315. Lovley, D. R., (2003). Cleaning up with genomics: applying molecular biology to bioremediation. Nature Reviews/Microbiology, 1, 35-44. Available at: (www.nature.com/reviews/micro). Lytle, J. S. and Lytle, T. F., (1987). The role of Juncos roemerianus in clean up of oil-polluted sediments. Proceeding of the 1987 Oil Spill Conference, American Petroleum Institute, Washington, DC. 495-501. Mackay, D., Shiu, W. Y., Chais, A., Southwood, J. Johnson, C. I., (1985). Environmental fate of diesel fuel spills on land. Report of Department of chemical Engineering and Applied Chemistry of University of Toronto for Association of American Railroads, Washington, DC. Mathews, P. J., (1980). Toxicology for water scientists J. Environ. Manag., 11 (1), 1-14. H. eds. Elsevier, Kodansha Ltd. Tokyo. 241-260. Mueller, J. G., Lanze, S. E., Blattmann, B. O., Chapman, P. J., (1991). Bench-scale evaluation of alternative biological treatment processes for the remediation of pentachlorophenol and creosote-contaminated materials: slurry-phase bioremediation. Environ. Sci. Technol ., 25, 1055-1001. National Research Council (NRC), (1992). Environmental Neurotoxicology. National Academy Press, Washington DC. National Research Council (NRC), (1985). Oil in the sea; inputs, fates and effects. National Academy Press, Washington, DC. Oberdorster, E., Cheek, A. O., (2000). Gender benders at the beach, endocrine disruption in marine and estuarine organisms. Environ. Toxicol. Chem., 20(4), 23-36. Odu, E. A., (1987). Impact of pollution in biological resources within the Niger Delta. Technical Report on Environmental Pollution Monitoring of the Niger Delta Basin of Nigeria. Vol 6. Environmental Consultancy Group, University of Ife, 69-121. Okpokwasili, G. C., Odukuma, L. O., (1994). Tolerance of Nitrobacter to toxicity of some Nigerian crude oil. Bull. Environ. Contan Toxicol., 52, 388-395. Olson, B. H., Tsai, Y., (1992). Molecular approaches to environmental management. In: Environmental Microbiology ed Ralph Mitchell. John Wiley and sons Inc. Pub. New York,239-263. Onwurah, I. N. E., (2002a). Anticoagulant potency of water-soluble fractions of Bonny light oil and enzyme induction in rats. Biomed. Res., 13(1), 33-37. Onwurah, I. N. E., (1999a). Restoring the crop sustaining potential of crude oil polluted soil by means of Azotobacter inoculation. Plant Prod. Res, J., 4, 6-16. Onwurah, I. N. E., (1999b). Role of diazotrophic bacteria in bioremediation of crude oil polluted environment J. Chem. Technol. Biotechnol., 957-964. Onwurah, I. N. E., (2000). A Perspective of Industrial and Environmental Biotechnology. Snaap Press / Publishers Enugu, Nigeria, 148. Onwurah, I. N. E., (2002b). Quantitative modelling of crude oil toxicity using the approach of cybernetics and structured mechanisms of microbial processes. Environ. Monit. Assess., 76, 157-166. Onwurah, I. N. E., (1998). Biochemical oxygen demand exertion and glucose uptake kinetics of Azotobacter in crude oil polluted medium. Bull. Environ. Contam. Toxicol ., 60 (3), 464-471. Onwurah, I. N. E. and Alumanah, E. A., (2005). Integration of biodegradation half-life model and oil toxicity model into a diagnostic tool for assessing bioremediation technology, Industrial Biotechnology 1(4), 292 – 296. Onwurah, I. N. E. and Nwuke, C. P., (2004). Enhanced bioremediation of crude oil-contaminant in soil by Pseudomonas species and mutually associated adapted Azotobacter vinelandii. J. Chem. Technol. Biotechnol., 79 (5), 491-498. Onyefulu, K. O.,Awobajo, O.A., (1979). Environmental aspects of the petroleum industry in the Niger Delta, problems and solutions. In The Petroleum Industry and Niger Delta. Proceedings of the NNPC Seminar on Environment, 2. Paerl, H., Piehler, M., Swistak, J., (1996). Coastal diesel fuel pollution effects on the native microbial community. Poster presentedat the Meeting oftheAmerican Society of Microbiology, New Orleans May 19-23. Pelletier, M. C., Burgess, R. M,, Ho, K. T., Kuhn, A., Mckinney, R.A., Ryba, S.A., (1997). Phototoxicity of individual polycyclic aromatic hydrocarbons and petroleum to marine invertebrate lavae and juveniles. Environ. Toxicol. Chem., 16, 2190-2199 . Perry, J. J., (1980). Oil in the biosphere. In “Introduction to Environmental Toxicology (F.E.Guthrie and J.J. Perry Eds) Elsevier, NewYork, 198-209. Peters, K. E., (1993).Moldown JM. TheBiomarker guide, Interpreting molecular fossils in petroleum and ancient sediments. Prentice-Hall, Englewood Cliffs, NJ. USA. Prescott, M. L., Harley, J. P., Klan, A. D., (1996). Industrial Microbiology and Biotechnology. In: Microbiology. 3rd. Ed. Wim C Brown Publishers, Chicago, 923-927. Prince, P. C., (1992). Bioremediation of oil spills with particular reference to the spill from Exxon Valdez. Microbial Control of Pollution. (Eds. Fry Jc, Gadd GM Herbert RA, Jones CW and Watson-Craik 1A.) Society for General Microbiology symposium 48. Pritchard, P. H., Costa, C. F., (1991). EPA’s Alaska oil spill bioremediation project, Environ. Sci. Technol., 25 372-379. Ritter, W. F., Scarborough, R. W., (1995). A review of bioremediation of contaminated soils and ground water. J. Environ Sci Health. A., 30, 323-330. Rittmann,B.E., Smets,B. F.,Stahl, D.A.,(1990). Genetic capabilities of biological processes Part 1. Environ. Sci. Technol., 24, 23-30. Rittman, B. E., (1992). Innovations in biological processes for pollution control. In Environmental Microbiology edited byRalph Mitchel. John Wiley and Sons Inc. Publ N. York. 265-286. Rittman, B. E., (1987). Aerobic biological treatment. Environ. Sci. Technol. Proc., 21, 128-134. Ross, P., (1993). The use of bacterial luminescence systems in aquatic toxicity testing. In: Richardson M. ed,EcotoxicologyMonitoring VCH, NewYork, USA. 155-194. Salt, D. E., Blaylock, M., Rumor, N. P., Dushenkuv, V., Ensley, B. D., Chet, I., Raskin, I., (1995). Phytoremediation A novel strategy for the removal of toxic metals from the environment, using plants. Biotechnol., 13, 468-474. Scheibenbogen, K., Zybner, R. G., Lee, H., Trevors, J. J., (1994). Enhanced removal of selected hydrocarbons from soil by Pseudomonas aeruginosa UG 2 biosurfactants and some chemical surfactants. J. Chem. Tech. Biotechnol., 59, 55-59. Schnoor, J. L., Licht, L. A., McCutcheon, S. C., Wolfe, N. L., Carreira, L. H., (1995). Phytoremediation of organic and nutrient contaminants. Environ. Sci. Technol., 29 (7), 318A-323A. Shanks and McEwan (Southern) Ltd. (1998). Calvert. Landfill site; Information Booklet, Woodside House, Church Road, Woburn Sands, Milton Keynes, Bucks MK17 8TA. Short, J. W., Lindeberg, M. R., Harris, P. M., Maslko, J., Rice, S. D., (2002). Vertical oil distribution within intertidal zone 12 years after the Exxon Valdez oil spill in Prince William Sound, Alaska. Proceedings, 25th. Arctic and Marine Oilspill Program. Calgary, Alberta, Canada. June, 11-13, 57-72. Short,J.W., Heintz, R.A., (1997). Identification of Exxon Valdez oil in sediments and tissue from Prince William Sound and the North Western Gulf of William based in a PAH weathering model. Environ. Sci. Technol., 31, 2375-2384. Smets, B.F., Rittmann, B. E.,Stahl, D.A., (1990). Genetic capabilities of biological processes, Part II. Environ. Sci. Technol., 24, 162-170. Stomp,A. M.,Han, K. H., Gordon, M. P., (1993). Genetic improvement of tree species for remediation of hazardous wastes. In vitro cellular and Developmental Biology-Plant. 29, 227-232. Stroo, H. F., (1992). Biotechnology and hazardous waste treatment .J Environ. Qual., 21, 167. Tiido, T., Rignell-Hydbom, A., Jönsson, B. A. G., Giwercman, Y. L., Pederson, H. S., Wojtyniak, B., Ludwicki, J. K., Lesovoy, V., Zvyezday, V., and 10 others., (2006). Impact of PCB and p,p΄-DDE contaminants on human sperm Y:X chromosome ratio: studies on three European populations and the Inuit population in Greenland. Environ. Health Perspect., 114, 718-724. United Press International, (1986). Gasoline Reported threatening water’’ Boston Globe, June 25. Vega-Jarquin, C., (2001). Dengooven l, Magana-Plaza 1, Thalasso F, Ramas-Valdivia A. Biotransformation of n-hexadecane by cell suspension cultures of Cinchona robusta and Dioscorea composti. Environ. Toxicol. Chem., 20, 2670-2675. Ziegler, C. K., (2005). Using mathematical models to assess sediment stability. Integrated Environmental Assessment and Management, 2(1) 44-50.